With a bag of potatoes left after making the Friday Night Potato Galette, Jill and I decided to have baked potatoes for a couple of dinners. As you can tell from the photos below, Jill and I each have our own variations on the baked potato. 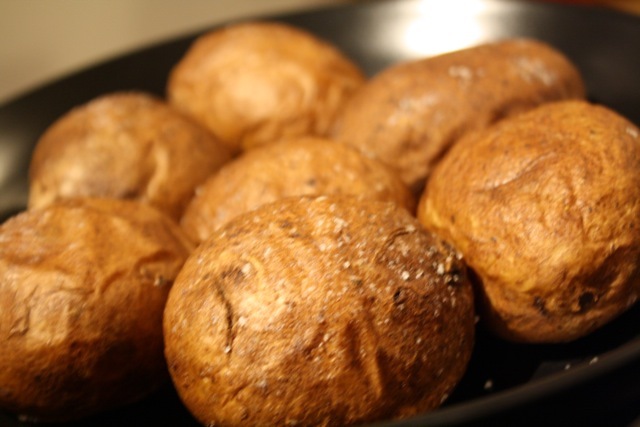 Baking potatoes is simple. I like to wash my potatoes well, stab them with a fork a few times, coat them in olive oil, sprinkle them with salt, and bake them directly on the oven rack at 350 degrees (Fahrenheit) for an hour. I put a baking sheet on the rack below the potatoes in case any of the oil drips off of the potatoes. Baking potatoes this way gives the skins a crispy texture with a slightly salty flavor that I really like since I eat the potatoes, skins and all. Once baked, the potato is an empty canvas ready for your creative food masterpieces. 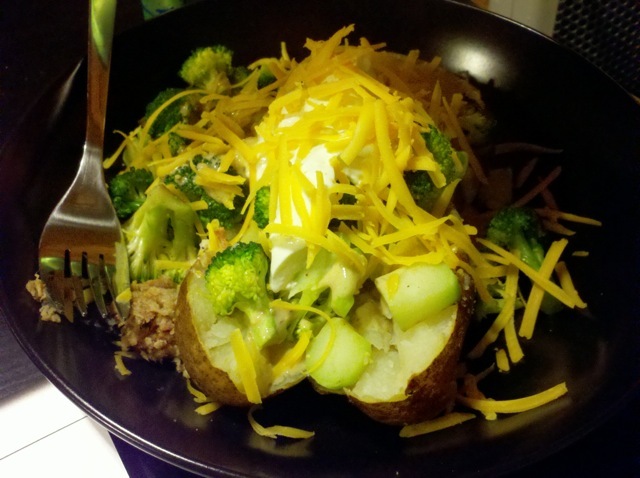 Jill opted for baked potatoes smothered in sautéed broccoli and topped with grated cheddar cheese and a spoonful of sour cream. I followed suit with the broccoli, cheddar, and sour cream, but added left over pulled pork from Piggy’s BBQ. 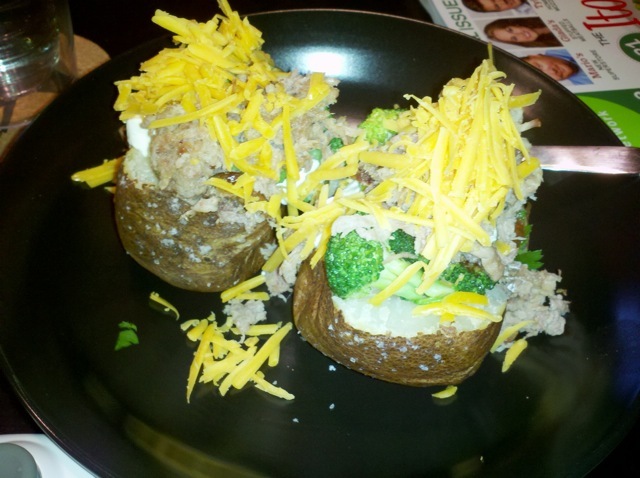 The baked potatoes were so good, we decided to make them again for dinner the following night. 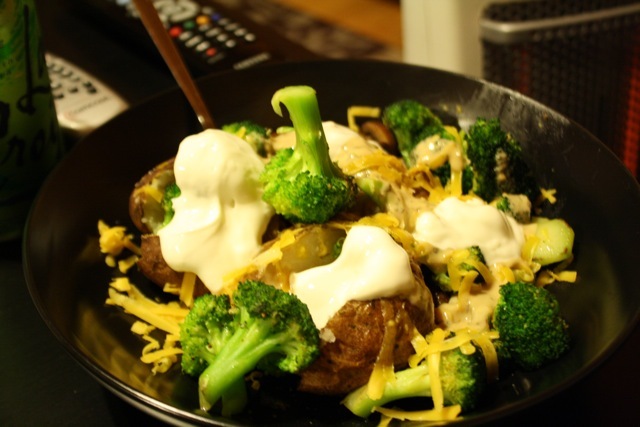 Like last time, Jill topped her potato with broccoli, cheddar, and sour cream, but this time added sautéed mushrooms and goddess salad dressing. I went with broccoli, cheddar, sour cream, mushrooms, and salsa. 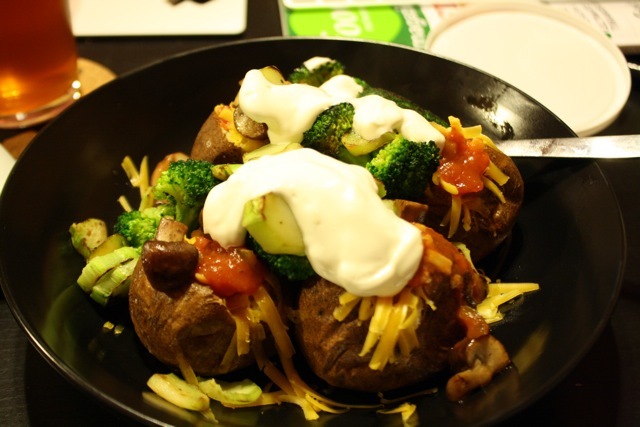 Although the potatoes are blank canvases for a variety of delicious toppings, they are quietly the star of the show. After reading that potatoes are one of the most likely vegetables to contain residual pesticides, I decided to buy organic russet potatoes from Earth Fare. Once baked, these potatoes were the creamiest potatoes Jill and I have ever eaten.